ChartArea is the place, where the chart graphic is drawn. The ChartArea represents a layout region of the RadChart control that holds certain chart series and axis data. 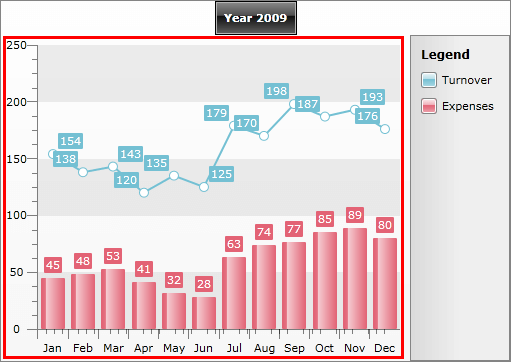 Additionally, the ChartArea exposes events for customizing the tooltips and making the chart more interactive. As you can see on the image above, the ChartArea has two axes - X and Y. By default X- and Y-axes are shown for all chart types except for those, which do not have axes at all - Pie and Doughnut charts. Use ChartArea.AxisX and ChartArea.AxisY to access the specific properties of the axes. You can also apply your own styles using AxisXStyle and AxisYStyle. Take a look at the Styling the Axes topic for more. 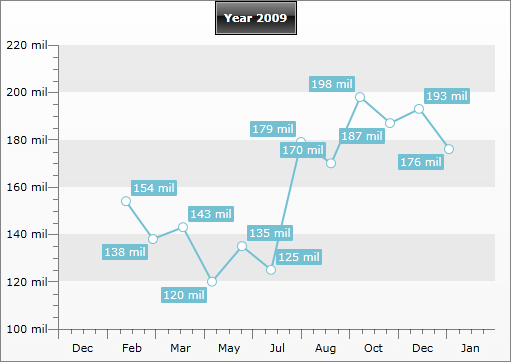 Use the AdditionalYAxes property to add more than one Y-Axis to your chart. To learn more about it read the Multiple Y Axes topic. Use the PlotAreaAxisXStyle and the PlotAreaAxisYStyle properties to set styles for the axes drawn inside the plot area. Example of such axes are the axes drawn in negative values scenarios.